When Robocop came out in 1987, no one quite knew the phenomenon that it would become. Sure, Ronald Reagan was in the office and crime was rampant, but who wanted to go to the theater just to see a cyborg future of that very same problem? As it turned out, almost everybody. Spawning toys, cartoons, two TV series, several sequels, and, of course, comics, Robocop became a powerful testament of the anti-capitalism movement of the decade. Is it any wonder then, given the current political climate, that Robocop should once again appear when we need him most? Thanks to BOOM! 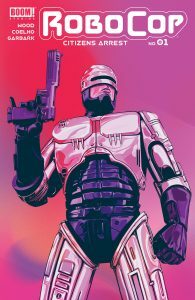 Studios, Robocop is back on the comic shelves with Robocop: Citizens Arrest. Starring a new lead but still bringing that old school dystopian corruption, Citizens Arrest tells a new story of future Detroit while throwing in some surprise visits from familiar faces. The story starts off two decades after the Robocop program. Robots have officially replaced Detroit’s police force and have been thoroughly trained to handle all manners of crime and disturbances while ensuring utmost safety and care for the innocent populace. Perhaps the most interesting part is the popularity of the new R/Cop app, pay-to-report a crime solution where citizens can report criminal activity from the convenience of their phone. Basically, the police are now crowdsourced. But not everyone is happy with the new changes, most of all, the human police who were shoved out of their jobs. This is where we meet Leo Reza, ex-cop who in a desperate last turn, finds the original Robocop and bids for his help to fight the corruption of the all-powerful Omni Corp (who created Robocop). But it seems like Robocop has been ‘retired’ and is nothing more than a ghost of his former self. Will Reza be able to find a way to help the last hope for humanity or did the future just get that much bleaker? Robocop: Citizens Arrest is a fun, if not a bit of a confusing read. It definitely took a couple read-throughs to understand what each character was trying to gain and the reader does need to brush up on the first movie beforehand. Luckily, the comic does tread over some the same ground as the movie, instead in this one, the police have been successfully pushed out by Omni Corp and replaced with robots but have yet to gain the land for their Delta City utopia. It retains that classic gentrification and consumerist vibe to it that made the movie so popular but also takes it one step further to the future that the original Robocop failed to stop. Overall, the story is entertaining and blends our modern technology with the envisioned retro-future of the 80’s, creating a work that fits well into the Robocop canon. The characters don’t exactly stand out and follow a tried-and-true method of a family man protagonist, a devilishly evil villain, and the spine-less mayor who is caught in between his citizens and the waves of progress. Once again, it is canon for the Robocop universe (the eighties weren’t exactly known for breaking character tropes), but it would’ve been fun to see at least one of these characters break the mold. Still, it’s pretty cool to see Alex Murphy make an appearance and the robot designs were straight from the players handbook, which really helped authenticate the experience. The writer, Brian Wood, does his best to bring the new Robocop vision to life and, as stated, seamlessly brings in our future with that of the envisioned future. Having written the popular dystopian comic DMZ previously, he has no trouble diving straight into the world of New Detroit while still managing to make it a new reading experience. Jorge Coelho’s art sits well with Woods words and doesn’t skimp on the line work or backgrounds. It’s got a good, pulpy feel to it when needed but also runs a bit softer when the bright lights of Omni Corp splash across the page, perfect for the shared landscape of the rich and the poor. It really seems like these two are fans of the original films and do their best to bring the same bilateral opposites of the future as much as the film creators did. 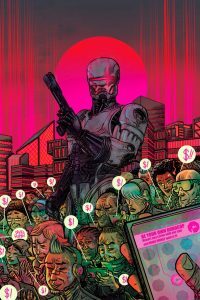 If you’re ready for this work of the not-so-distant future, Robocop: Citizens Arrest is on shelves now!